My long-awaited scarf tying tutorial is finallyyy here! Ha! I’ve been meaning to do this for a legit year and it just took me forever to actually do and even as I was editing photos I realized it would be better in video format but since I don’t do that (yet), pics will have to do! Lots of people say they get overwhelmed trying to wear a blanket scarf so I chose 5 of my favorite ways and broke it down for you! 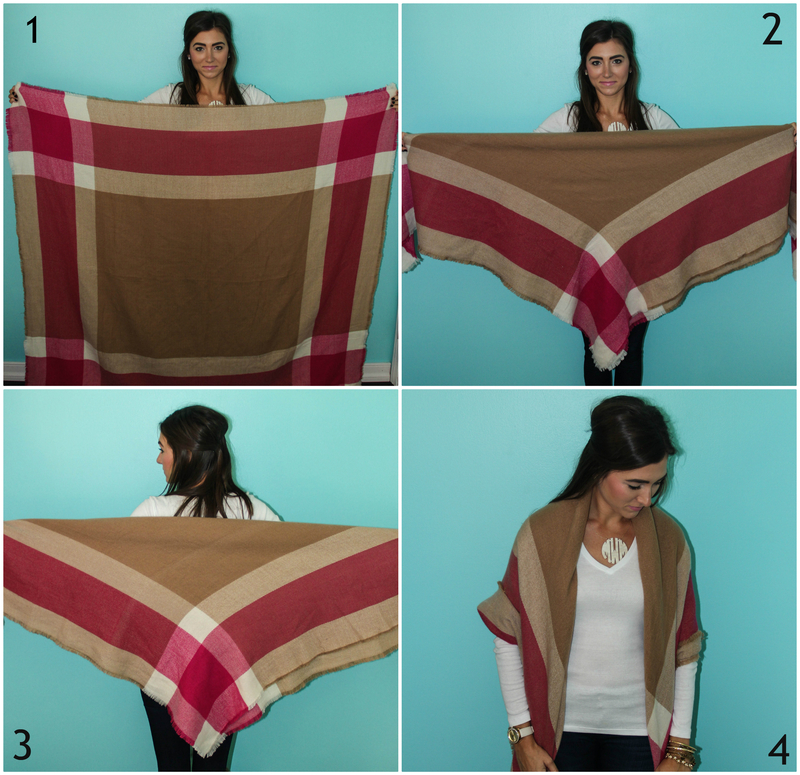 This tutorial only works for a true blanket scarf which is a perfect square. I will post a couple of ways to tie a rectangle scarf some other time if you would like! 1. Shawl: I love wearing my scarf like this. 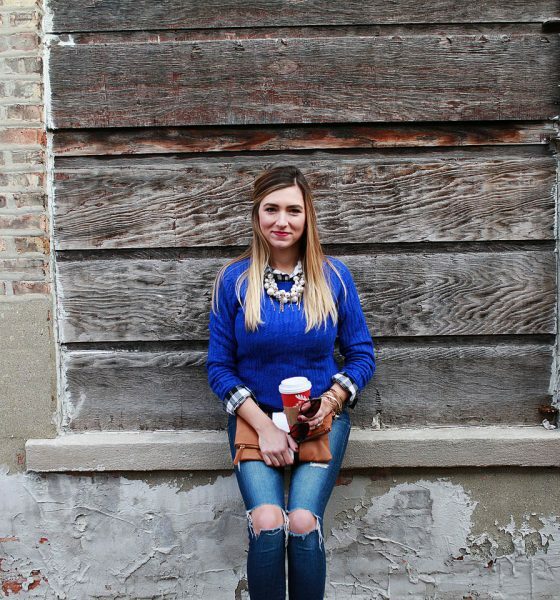 It’s cozy for all day and turns a t-shirt and jean look into a great Fall/Winter outfit. Start with your scarf completely open. Fold it corner to corner into a large triangle. Put the long side of the triangle behind your back with the point facing down and pull the sides over your shoulders. Tada- your scarf is a shawl/wrap. 2. Belted Poncho: This is option is a more pulled together cozy look. It’s nice not to have to worry about your wrap falling off your shoulders when you’re out and about. Start with your scarf open. Fold the long side down once to take some of the length off the bottom. Put the long side of the triangle behind your back with the point facing down. Pull the ends of the triangle over your shoulders and down in front. You want them over your shoulders a little longer than a short-sleeved shirt. Grab your favorite skinny belt and put it underneath the scarf in the back but over the front. If you belt the entire scarf down you won’t be able to move your arms much, ha. Belt it tight enough that it won’t move around but not too tight that you can’t move your shoulders around as needed. Spread out the scarf around your waist to give it a poncho look and loose/tighten your belt as needed. Tada you have a belted poncho! 3. 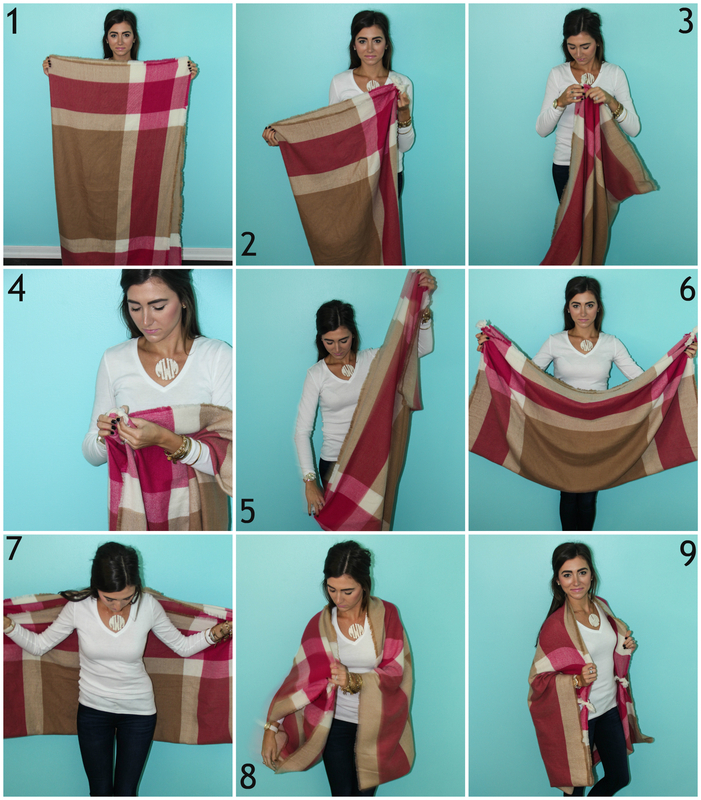 Basic Blanket Scarf: So this is the traditional way to wear your scarf and what you probably see around all the time. Start with your scarf in the giant triangle like we have for the previous two ties. Fold the long end of the triangle down twice to lessen the length and the bulk around your neck. With the point facing down in front, wrap the long sides behind your neck and pull around and over the opposite shoulder. Fluff and arrange the long portions underneath the triangle slightly and you’re good to go! 4. Knotted: Tying your scarf this way looks more like an infinity scarf and get’s rid of the bulk. This will keep your neck extra warm! Start with your scarf in the giant triangle like we have for the previous ties. Fluff and arrange the point of the triangle where you want it to sit on your neck. Grab the two long portions of the scarf. Cross the long portions in front of the triangle and tie them. Make it into a nice big knot and keep it loose but tied. 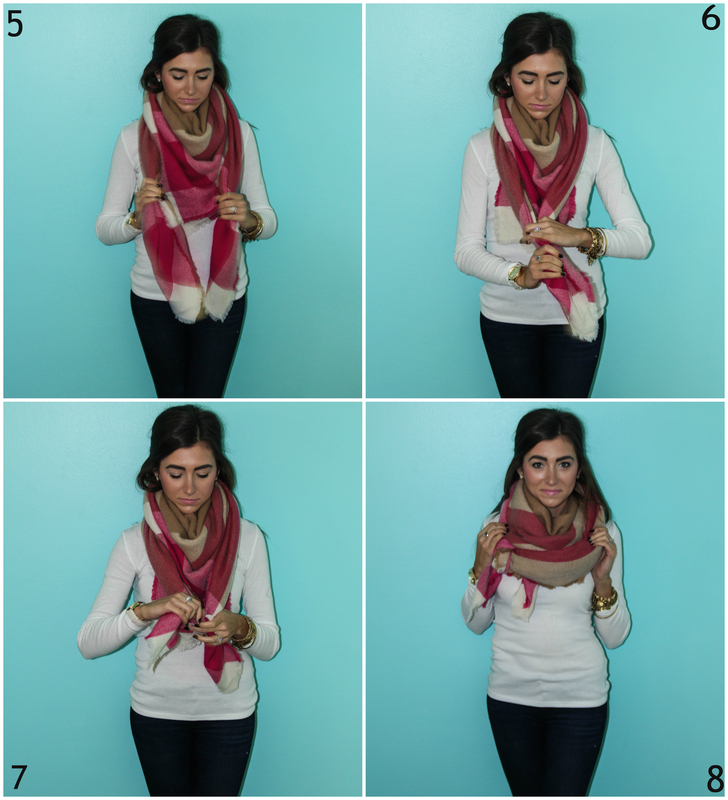 Fluff the scarf and move the knot towards one side of your neck and you’re good to go! Your blanket scarf is now a knotted infinity. 5. Kimono: This is another great cozy option for your casual Fall/Winter days. 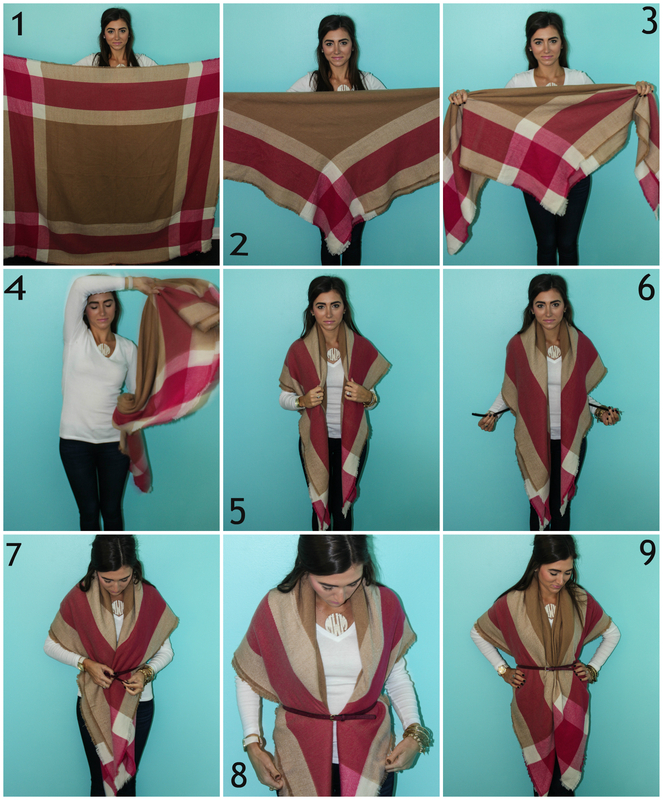 Start by folding your blanket scarf into a giant rectangle. Make sure one of the short sides is facing up and the corners line up. Make sure the knot is tight so it doesn’t come undone when you’re wearing it. Do the same thing to the other corners. Your scarf should look like this and have two knots where the corners were. Put the rectangle behind your back with the knots facing up so the open part is going along the top of your back. Put your hands into the “sleeves” underneath the knots and adjust the kimono so it’s all the way on. When you have it on, the knots/open part of the kimono will fall in front of your body. Tada you have a kimono! 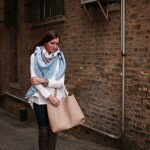 Now you know 5 ways to wear 1 blanket scarf! Hooray! Which one is your fave? If you try this tutorial be sure to tag me on Instagram/Facebook or comment below and let me know what you think! 🙂 Hopefully I broke it down and made it as easy as it really is! I loved showing some fun ways to tie a scarf last night at ladies night out! 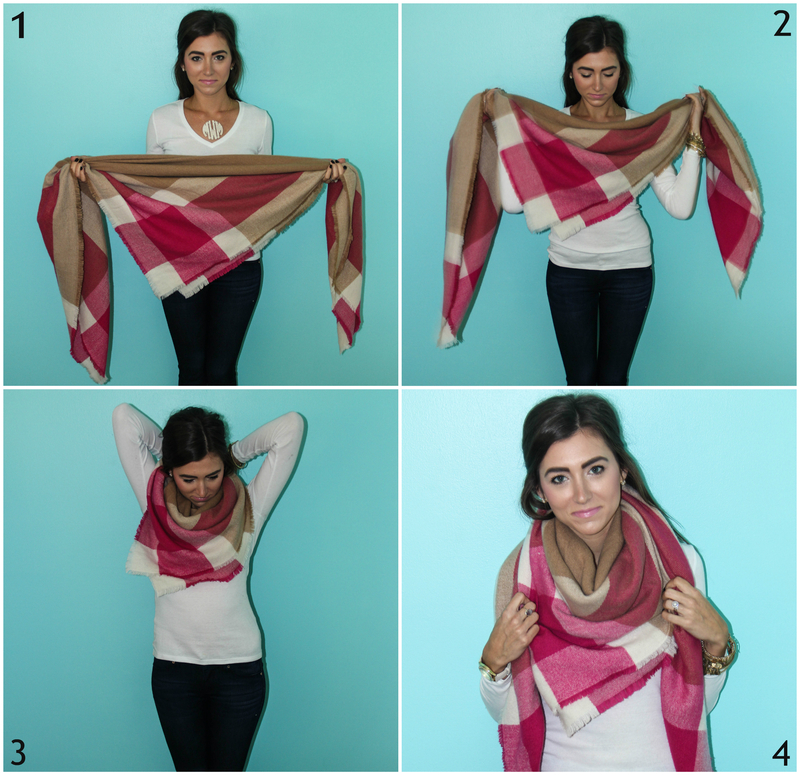 It’s amazing how versatile 1 scarf can be and this is just a few of the many ways you can tie a blanket scarf! If you’re bored you can always look up scarf tying videos on youtube…there’s a ton of great ideas! I linked some of my fave scarves below that would make great gifts orrr an addition to your scarf collection! 🙂 Don’t ask me how many I have, it’s embarrassing or awesome. Depending on how you look at it! Ha! Wearing your blanket scarf belted would be a great Thanksgiving look; which is somehow next week already! ::wide eyed emoji on repeat:: Yike! Even though I’m beyond exhausted, I’m so looking forward to a fun couples closet consult tonight and then comes lotsss of packing over the next few days so we can move this weekend or early next week! We’ll see what happens! Thanks for stopping by! November 18: Today I am thankful for shelter from the cold and scarves to keep me warm. Thinking of the those you have go and nothing to keep them warm this time of year. If you’re reading this you’re so blessed. Don’t forget it!